The GUEST program follows a progressive training path of comprehensive qualifications at Introductory level, Advanced level, and Management level through an established industry training standard, developed for Professional Interior Crew leading to the issue of a Certificate of Competency at each stage. 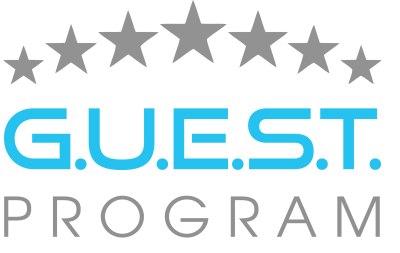 The GUEST certification system is modular in structure, with training objectives & syllabus outlines for each individual module defined in the GUEST Guidelines. On completion of each level of training, the crew member can apply for the relevant COC. All Yacht Service and Guest Days need to be recorded in either a PYA Service Record Book, Log Book or Discharge book backed up with a signed Testimonial for each entry. Yacht Senior Steward / Stewardess GUEST© CoC: 12 month Yacht Service and 60 days Guest Service required. Yacht Chief Steward / Stewardess GUEST© CoC: A further 12 months Yacht Service and 60 days Guest Service from issue of Yacht Senior Steward / Stewardess GUEST© CoC. 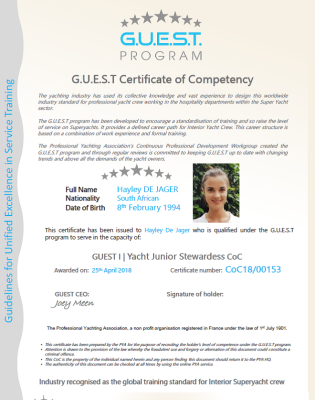 In order to be eligible to apply for a GUEST Certificate of Competence, the applicant will need to hold the appropriate certification and Sea Service. For those with previous expereince and hospitality education, its possible to apply for the CoC through the Assessment Route .